They had been tracking the swell off the coast of Africa for two weeks. A slow moving, season defining system making its way across the Indian Ocean- our little island’s home wide open to accept its almighty power. Waking blurry eyed after a restless night sleep, the light was yet to show on the horizon to bring another day. Making my way to the hut barefooted, I gasp as I stub my toe heavily on a large chunk of coral. Limping off in pain I gaze across the green grass, the light from the porch revealing several hundred more chunks of coral far up the bank. I’ve not known the water to ever come up this high before. This wasn’t a good sign. I pour myself a strong cup of coffee and sit quietly, hearing the roar of the ocean towards the darkened sea, the lull between sets softened by the usually loud sounds from the jungle behind me. “It’s not a good day to go”, the voice of the surf camp owner breaks across the room with concern. I respond “I can’t stay, I’m not putting my life in his hands, I just don’t feel safe here with him”. the camp, one of which is my now estranged boyfriend. In a heartbeat he had dictated my own love for him as non-existent. His delusion and insecurity just wouldn’t cut through the truth of how strong my feelings were for him. I’ve seen too much of his aggression to negotiate any possible terms to stay. My time in this tropical paradise has felt like a dream but so quick it can turn into a living nightmare overnight. My journey ahead (as I find out) requires navigating one of the biggest swells in years in a dugout canoe with outboard for close to three hours, before anxiously waiting twelve hours in a small fishing village for a public boat. This unforeseen wait only adds more time to my already twelve hour overnight boat ride, sleeping top to tail with hundreds of locals. From the mainland I wait six hours for a connecting flight, travel by car for two hours to the small airport where an hour by plane lands me in an international airport. From here I can catch a three hour flight to Bali where I plan to touch down at around 3am- two days from now. The fact I face this journey solo rules out any chance for emotions to break through as they are quickly overruled by hits of adrenaline. Standing on the shore with a group of local Indonesian workers, my surfboards are firmly strapped in the wooden canoe and wrapped under a large torn tarp. I bear a flimsy poncho, well and truly not up for the task ahead. We wait for the sets to pass before we can escape out to sea, via the narrow reef passage before us. My eyes nervously scan over the dark eyes of the workers who wait in silence, looking equally as fearful as each other. It’s hard to gauge the size of the waves in the stormy conditions but it’s easily fifteen to twenty feet and building rapidly. The entire front section of the camp is flooded out, with coral strewn across every square inch of land. The darkened skies above threaten downpours. Further up the beach my old bamboo hut is starting to give way, as the tide gushes ferociously under its floor and over the embankment, filling the lagoon that lays behind it. With every set the water races up the beach smashing broken coral against my ankles and I’m constantly rushing behind a palm tree for protection. I push the thoughts out of my head that this was the very location the Boxing Day Tsunami tore through only years before. Twenty minutes pass and there’s still no safe break between the relentless sets. We continue to patiently wait before I hear the voice of the camp owner “Ok go, go, go, go, Shannon get in, satu, dua, tiga, puush, satu dua, tiga puush”. I scamper into the boat, heart racing out of my chest and adrenaline filling every vein in my body. The group of workers use all of their strength to push the boat off the coral sand. Whitewash races over the edge of the boat instantly soaking everything within. The engine splutters as it attempts to start and we slowly begin to head out towards the rough sea. I glance back towards land with a heavy heart, as I see no sign of the man I thought I was in love with. I pull my hat down over my red ravaged eyes, not wanting to look at the site ahead. Each time we reach the peak of the ocean swell, I cling to the edges of the boat as we drop violently onto the flat water with a loud thud, almost shaking me out into the rough waters. Every few seconds it feels as though someone is holding a large bucket of water and releasing it onto the boat. My intense love for the ocean fades in this moment as fear washes over my body. I’m relieved as we miraculously make it around the back of the lineup. I glance up and am speechless at the sight of open ocean swell. Scenes from the movie “The Perfect Storm” flash in front of me, I feel the boat climb a very steep section of swell for what feels like eternity in this moment, I continue to hide under my hat. “Uh oh”, I hear from the Indo guy, as he switches the engine off. I shut my eyes tightly and crawl below the broken piece of wood I’m sitting on and brace my knees. We decline down the opposite side of the swell and violently hit the flat surface, as gallons of water are thrown onto us once again. The entire boat gives way to the right side, forcing the edge to catch and sink beneath the surface where we come close to capsizing. The price we pay to ride waves of perfection. With no sign of any Westerner, she passed cautiously through the rotted wooden boat catching glimpses of dark faces peering through the shanty cabins intrigued by her blonde hair and tan skin. Given the spontaneity of the six-month journey she quickly realised that her basic Indonesian would not serve her in this situation. There was a task she had been putting off for as long as she could bear but she was now desperately needing to locate some form of a toilet. The rear of the boat was dark and unexplored, a kerosene lamp clattered noisily against the wall, hung by a tattered rope giving just enough light to locate the only door she hadn’t attempted to enter, a door barely hanging upright on its hinges. An Indonesian man sat nearby, cigarette poised between his lips, his dark eyes staring her down, she passed with little care as she was at the point of bursting. Sea sickness hadn’t bothered her until the sight of the apparent toilet, perhaps it was lucky to not be so well lit as she closed the rusty door, barely managing to fit in the small area, the rock of the sea causing her to slip and slide on the mouldy floor, the stench almost unbearable. She noticed a small coke bottle and plastic pipe letting water pass through the drilled hole in the wooden deck, barely keeping up to its intended task but assuring her she must have been in the right place. She returned to her sleeping area, stomach now churning, once again finding her spot nestled between dozens of Indonesians on the floor. Chickens noisily contained in woven cages, cockroaches scrambling past avoiding the heavy footprint of restless children. Her iPod became her saviour, relieving the anxiety and reality of how far she had stepped out of her comfort zone, the lyrics of her favourite songs meaning more than ever before, each beat matching the beat of her heavy heart as she eventually drifted to sleep only to be woken by the violent sway of the boat in the treacherous swells. She lay quietly observing the movement of life around her. She began to cultivate thoughts of the human condition, the basic need for survival and safety, food and water, love and equality. Later she would discover a boat travelling that night on the very same route had capsized in the rough seas killing seven locals. She had risked it all for the prospect of perfect waves. She was two hours away from her destination, now travelling by a small dugout canoe navigating bays lined in palm trees and mesmerising crystal blue waters. It had taken almost three days of travel. The sight was absolutely spellbinding. A surfer standing tall in a perfectly groomed overhead barrel breaking along a pristine reef. 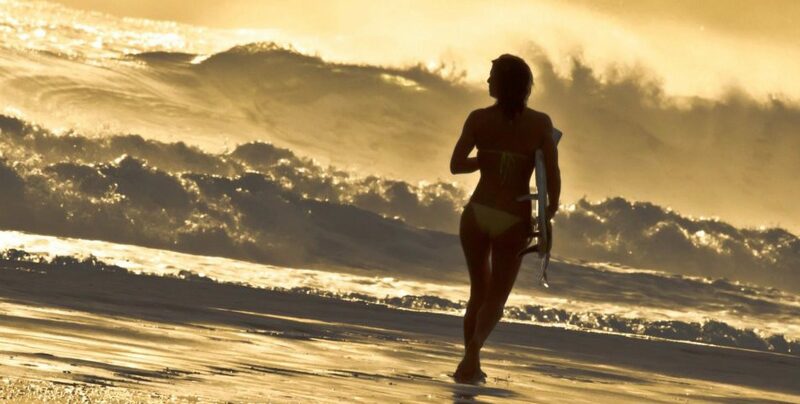 An immense grin crept over her weary face and shivers lit up her spine, her previously held doubts of the journey vanished and she had finally reached the ultimate surfer’s dreamland.